The Country Star Tours AgaiN, JOINED BY BRETT YOUNG! The fast-rising country songstress is back and hitting the road this spring, fresh off the back of the November 2017 release of her second album Unapologetically. A heady blend of slick pop production, country honesty and the singer's emotive, soaring vocals, the LP is a sonic diary in which Ballerini bears the highs, lows, love and losses of growing up, sharing her journey of self-acceptance in the face of high-pressure fame with her fans. 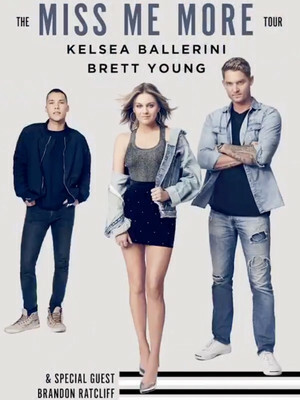 Joining Ballerini on the road for her final string of dates beginning in April is no other than the 'In Case You Didn't Know' singer Brett Young, who recently released his new album 'Ticket To L.A.' and Brandom Ratcliff will also be sharing the stage. Sound good to you? Share this page on social media and let your friends know about Kelsea Ballerini at Hertz Arena. Please note: The term Hertz Arena and/or Kelsea Ballerini as well as all associated graphics, logos, and/or other trademarks, tradenames or copyrights are the property of the Hertz Arena and/or Kelsea Ballerini and are used herein for factual descriptive purposes only. We are in no way associated with or authorized by the Hertz Arena and/or Kelsea Ballerini and neither that entity nor any of its affiliates have licensed or endorsed us to sell tickets, goods and or services in conjunction with their events.